Recently released Annihilation (Garland, USA, 2018), based on the 2014 novel of the same name by Jeff VanderMeer, is a sci-fi horror which follows a group of women military scientists into an otherworldly “shimmer” to discover its origin. The cast is led by Jennifer Jason Leigh’s Dr Ventress on an expedition into the affected area, where they encounter mutated forms of wildlife, with fatal consequences for all women, bar Natalie Portman’s Lena. She uncovers the truth behind the paranormal presence, and the film further aims to establish empowered action women, with agency over their life choices as the leading ladies of their own lives. The team of five soldier-scientists voluntarily venture into the mysterious “shimmer”, already known as a deadly force, with many previous groups never returning and presumed dead. As the women set off into the unknown, in their khaki ensembles, with oversized rucksacks, armed with equally oversized guns, one shot captures the group from behind as they near the edge of the shimmering forest area. This image is reminiscent of the 2016 Ghostbusters reboot with the genders of the action heroes reversed and female ghost-busting leads saving the day. 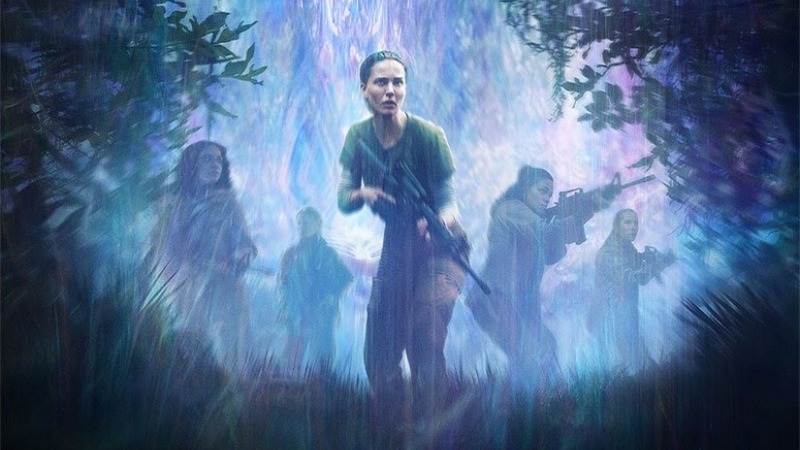 In Annihilation, the action women are also navigating through paranormal activity and tasked with resolving the otherworldly problems, whilst building on the evident capability and diversity of women in strong, action-packed roles. Annihilation provides a female-centric narrative, and Portman’s Lena has strong agency which becomes evident in her encounters with men. After having an affair with a colleague, he tells her she must hate herself, to which she assertively declares “I hate you too”, telling him to get out. Instead of being told how she feels, she bites back, showing authority over her own thoughts and feelings. During the interrogation after escaping the “shimmer”, Lena again dismisses the male’s opinion, that the alien was destroying everything. She tells him “it wasn’t destroying, it was changing everything, it was making something new” – having witnessed the events herself, she rejects the man’s hypothesis. If the “shimmer” was indeed making something new, perhaps its mutation of things in ways not thought possible exemplifies the way women are, from a 2018 perspective, shaking things up in the filmmaking process in the aftermath of the #MeToo and #TimesUp movements. Since Annihilation was in production prior to the #MeToo movement of 2017, the “shimmer” can also be seen to embody the film industry during the Weinstein era. With the soldier-scientists of Annihilation attempting to lead the way in increasing female-centred narratives, they uncover the empowering potential of an action film with women as the main characters. While the “shimmer” continues its patriarchal reign, killing off all of the original women and only allowing the cloned Lena to survive, perhaps in the aftermath of the #MeToo movement, the increased usage of ‘F-ratings’, and greater attention placed on balanced representations, this will one day allow Lena and her colleagues to prevent the continuation of the “shimmer”-y, patriarchal dominance over the film industry.